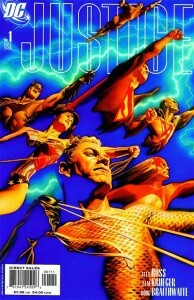 I just finished reading the self-contained DC Justice series #1-12. The entire run was co-written and drawn by Alex Ross, so the art is spectacular and the characterization is spot-on. That’s not surprising, since I associate Ross with a consistent quality and craftsmanship that I don’t expect with most comic creators. I really appreciate the epic feel without a cascading set of companion purchases, you can get the entire story in just 12 issues. Justice pulls together the Justice League and many of their most familiar enemies for a story set on a grand scale. I don’t want to spoil the premise, but one thread involves the release of Batman’s secret files on his companions and foes, several of which are revealed at the end of each issue, which is a treat. Ross managed to showcase the complex humanity in every character (including the aliens and talking gorillas), never succumbing to the bla impersonal action blowouts that can easily overwhelm some comics. There are big action blowouts, but by using the first-person voices of several characters in turn, we’re still able to see the personal aspect of the biggest battles. It’s tough to convey the fact that this is also full of very funny moments, grounded in iconic characters we know well. I can’t be the only one to crack up at a well-placed Batman glare. This entry was posted by florence	on Monday, October 20th, 2008 at 9:00 am and is filed under issues. You can follow any responses to this entry through the RSS 2.0 feed. You can leave a response, or trackback from your own site. So, Does anyone out there have some suggestions of what I should pick up?